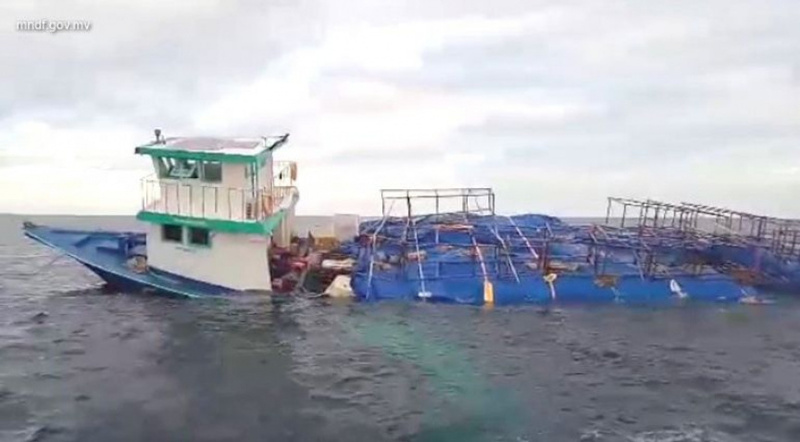 The 100-foot cargo boat “Maavaa Star” has sunk 4.7 nautical miles off the coast of V. Fulidhoo after taking in water. Maldives National Defense Force (MNDF) says the incident was reported to the authority at 6:15 am this Sunday. MNDF says the Coastguard provided its assistance to the people onboard as soon as the incident was reported to the authority. According to MNDF, the boat started taking in water after it wrecked on a reef and damaged its hull. There were five people onboard when the incident took place; three Maldivians and two expatriates. All five have been evacuated on a sea ambulance. MNDF said the boat was carrying mostly timber, and advised boats travelling nearby to be on the lookout for drifting wood.